Blurb Description: T.A.G. You're It..."It is 4 a.m. when they come for me. I am already awake, strung out on the fear that they will come, and fear that they won't. When I finally hear the click of the latch on the dormitory door, I have only a second to brace myself before-"At Cate's isolated boarding school Killer is more than a game-it's an elite secret society. Members must avoid being "killed" during a series of thrilling pranks-and only the Game Master knows who the "killer" is. 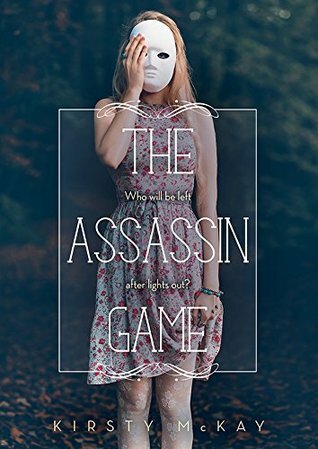 When Cate's finally invited to join The Guild of Assassins, she knows it's her ticket to finally feeling like she belongs.But when the game becomes all too real, the school threatens to shut it down. Cate will do anything to keep playing and save The Guild. But can she find the real assassin-before she's the next target? OKAY. YOU USE THE WORD ASSASSIN AND SUPER ELITE SOCIETY AND I’M LEFT THINKING MURDERRRR. I should definitely warn you, because this was a let-down for me, that there is NO MURDERING IN THIS GAME. The Assassin’s Guild is an “elite secret society” at a high school for prodigies, called Uframville and every year, after a reaping and an initiation process, a game called “Killer” begins. You basically pick lots and the person that is the “Killer” needs to FAKE KILL ALL THE MEMBERS. If they figure out who the “Killer” is, they lose and the game is over. Cate is DYING to be a part of this society. She’s not a prodigy and has never felt like she belonged, and the only reason she’s there is because she owns the island. It’s her only chance to be accepted, it’s her only change to feel at home. The Game, however, slowly spirals out of control and more intense at the same time, and nothing is ever that same again. IN ALL HONESTY, the ACTUAL murder thing was my fault, and it only REALLY affected me for a while, until I actually started getting into the “Kills” WHICH WAS REALLY FUN AND INNOVATIVE AND ALL ABOUT GUESSWORK. And about three “kills” into the book, IT JUST STOPPED. Suddenly, there was no game being played but one of who could be a better catfisher and causing people allergic reactions and the LOVE SQUARE. Screw that, it was almost a love pentagon. GOD HELP ME. I can HANDLE two love interests but FOUR? REALLY? And the ending. GOD. I was really kind of disappointed with it. The one thing I really did love about this book was Fletcher because OMG, he was perfect and a little crazy and all around wonderful. All in all, a book that had the POTENTIAL and the HUMOUR and CREATIVITY to be so much more, but it just fell flat. What books about REAL ASSASSIN'S would you recommend? I'm dying for something a little #stabstabstab (APART FROM NEVERNIGHT) and I would love some recommendations! What is your opinions on LOVE TRANGLES/ SQUARES/ PENTAGONS? When does it get to me TOO much for you?